NASA has created a 3D model of melting snowflakes. While the video of the model is actually very interesting to watch, there’s much more to the story. The U.S. space agency believes the melting snowflake model could be very helpful when it comes to forecasting specific details about winter storms that are on the way. Scientist Jussi Leinonen from NASA’s Jet Propulsion Laboratory developed the model, and the agency published a video of it on its website and on YouTube via the Goddard Space Flight Center account. We’ve embedded the full video of the melting snowflake model at the bottom of this post. The 3D model shows how real snowflakes melt and covers all stages of the process. As NASA explains, the process begins with meltwater collecting in the concave parts of the surface of the snowflake. As it melts, the liquid parts grow gradually and then merge, forming a liquid shell around the core, which is still ice at this stage. Eventually, the entire snowflake is transformed into a drop of water. The snowflake that Leinonen modeled was less than half of an inch in length and made up of numerous ice crystals. Each of the ice crystals have arms, and their arms get tangled up with each other when they smash into each other while falling through the air. Leinonen wanted to build the melting snowflake model because he was interested in seeing the impacts snow has on remote sensors while it melts. NASA explained that radar images of the atmosphere appear in layers, and the layer that’s at the altitude where the snowflakes are melting appears a lot brighter than the layers that are on either side of it. Scientists aren’t sure why, although there’s been debate about it. 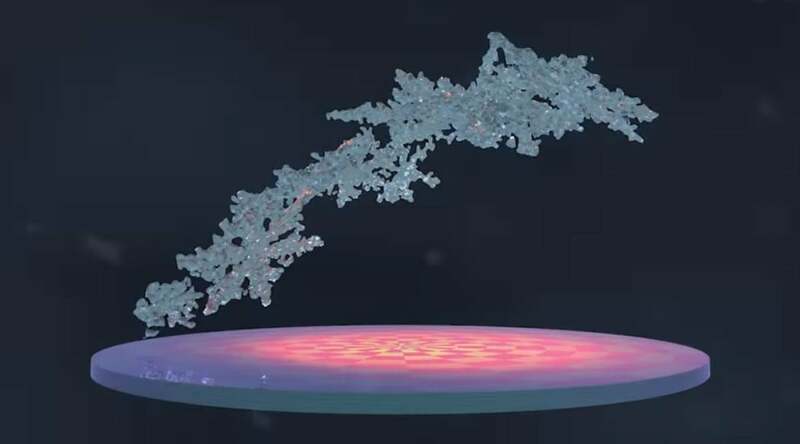 While there have been some simpler models showing a melting snowflake, Leinonen’s model is more detailed in how it displays this bright layer where the melting is occurring, so scientists hope to gain a better understanding of how it works. There’s hope that Leinonen’s numerical model will help as researchers study melting snow. NASA also hopes that by learning more about ho snow melts, scientists will be able to identify specific radar signatures which suggest that snowfall in a particular area may be wetter and heavier. This could help forecasters better predict when a winter storm is producing snow that’s more likely to break tree limbs and snap power lines, thus improving their ability to predict winter weather hazards. Scientists hope to be able to identify specific wavelengths on radar which signify that snowfall in a particular area may be wetter and heavier than snowfall in another area. Studying snowflakes is just one way scientists study the regions of Earth that are frozen. This year NASA is planning a pair of new satellite missions and preparing research to better understand Earth’s frozen areas, which include ice sheets, permafrost, snow cover, glaciers and ice floating in the sea. The space agency expects to share more information on its study of Earth’s cryosphere throughout this year. A paper on the melting snowflake model was published in the Journal of Geophysical Research: Atmospheres.